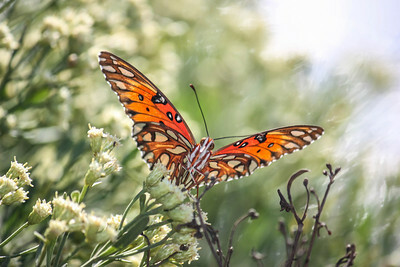 A Gulf fritillary (Agraulis vanillae) visits a Salt bush (Baccharis halimifolia) near Garcon Point, in the Florida panhandle. 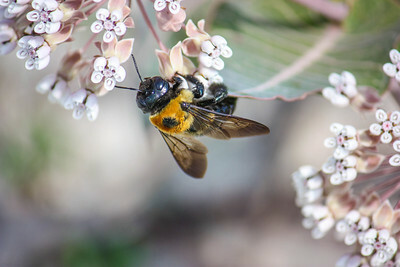 A carpenter bee visits an endangered milkweed at the Naval Air Station in Pensacola, Florida. 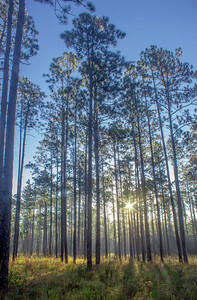 Sunrise in Blackwater River State Forest near Milton, Florida. 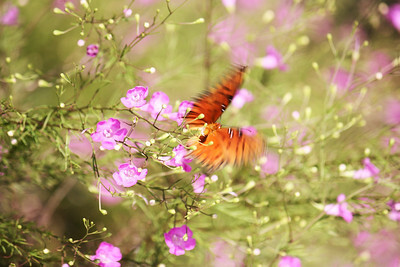 A Gulf fritillary (Agraulis vanillae) takes flight at Fort Pickens State Park near Pensacola Beach, Florida, creating a blissful blur of color. 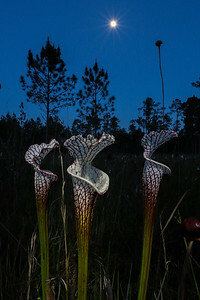 I had a vision before I ever captured this image of a trio of white-topped pitcher plants (Sarracenia leucophylla) in a seepage bog in Baldwin County, Alabama. As Southern naturalists we are used to ambling along in our favorite longleaf habitat type looking down in search of plants, amphibians, reptiles, lichen, insects, or any of the other (often overlooked) varieties of smaller wildlife that depend on longleaf pine ecosystems. But I wanted to capture a different perspective; what would this habitat look like to a frog or a grasshopper perched on a nearby pitcher plant, looking up at one of the world's most beautiful flowering plants? Folks have said that in pre-settlement times you could have walked for 500 miles (from present day New Orleans to Tallahassee) without ever leaving such a pitcher plant bog. These carnivorous plants thrive in nutrient poor soils and make up for it by eating a variety of insects, frogs, and lizards. 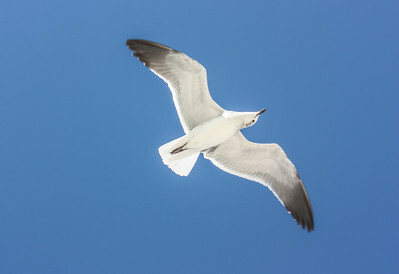 A gull peers down over Garcon Point in northwest Florida. 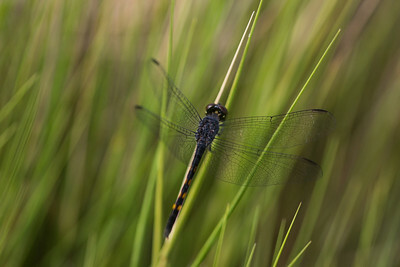 I photographed this Seaside dragonlet (Erythrodiplaz berenice) in a salt marsh in coastal Mississippi. 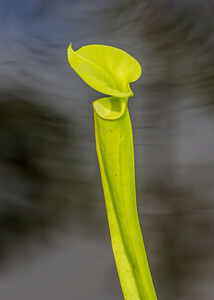 A natural pond in Blackwater River State forest serves as an interesting backdrop for this Yellow pitcher plant (Sarracenia flava). The Gulf Coast, especially coastal Alabama, Mississippi, and Florida, is known as the pitcher plant capital of the world. 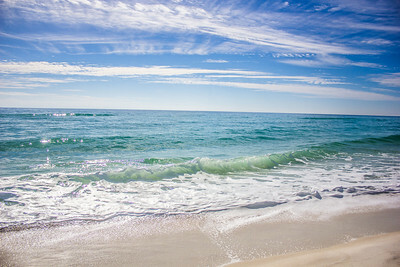 Midday at world-renowned Pensacola Beach, Florida. 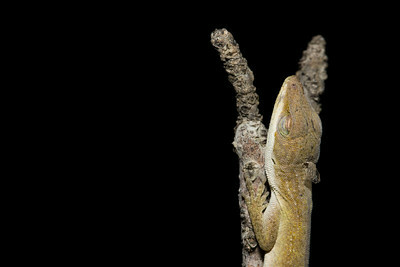 A native Green anole (Anolis carolinensis) catches some shut-eye near midnight in Blackwater River State Park, northwest Florida. You're looking at North America's most biodiverse forest: the longleaf pine forest, relegated primarily to the Deep South. 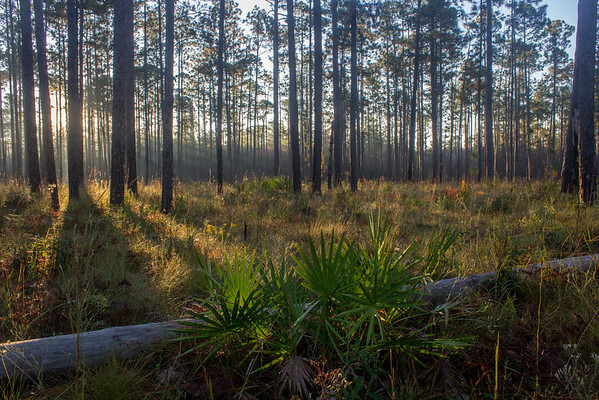 Some of the largest tracts are found in northwest Florida, including this patch in Blackwater River State Forest. Other large tracts include Apalachicola National Forest, Eglin Air Force Base, and Conecuh National Forest in southern Alabama. 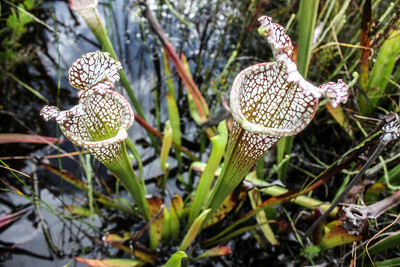 A pair of White-topped pitcher plants (Sarracenia leucophylla) at home in a drainage ditch in Milton, Florida. They are threatened in the state of Florida, and have a very limited distribution compared to other pitcher plants in the genus Sarracenia. 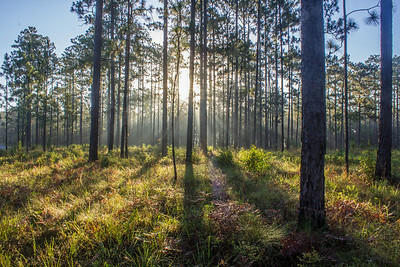 A sunburst finds its way through the thin canopy of a longleaf pine forest in the Florida panhandle. 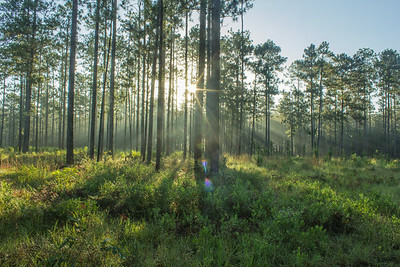 Longleaf pine forests, like this one in the Florida panhandle, boast some of the highest concentrations of flowering plants found in the temperate world. A staggering 60 species were counted in a one square meter plot in southern Mississippi. 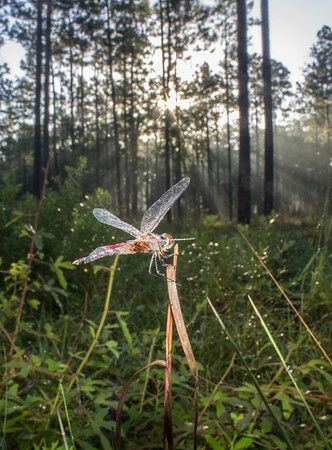 A dragonfly lies dormant as it waits for the rising sun to dry its wings, when it will take flight in search of insects, a highly abundant commodity in longleaf pine forests.